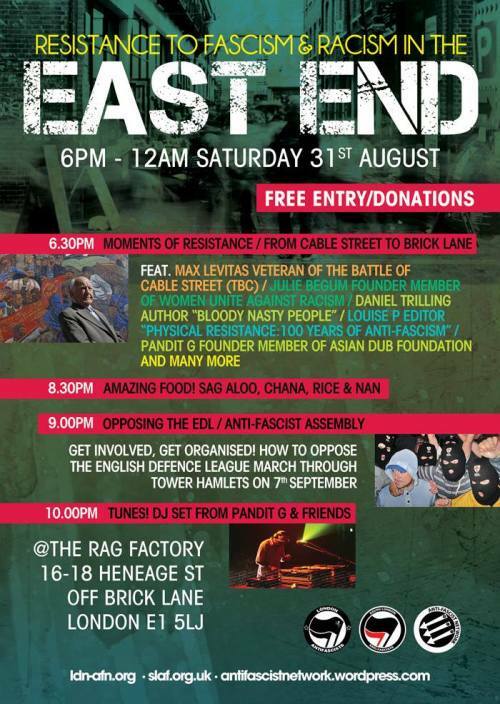 There will be distinguished speakers such as Daniel Trilling, author of “Bloody Nasty People”, a profile of the British National Party; Julie Begum, founding member of Women Unite Against Racism; and invited speaker, Max Levitas, a 94 year old veteran from the Battle of Cable Street. Participation, ideas and argument from the audience is very much encouraged. After the discussion, music will be provided with a DJ set by Asian Dub Foundation member Pandit G and a performance by Eritrean rapper Awate.